Cysticercosis, caused by encysted larva of Taenia solium, is the most common parasitic infestation of the central nervous system, but spinal cysticercal infection is relatively rare with the incidence reported as only 0.7-5.85%. , Majority of the reported cases of intramedullary cysticercosis ranged in age between 20 and 45 years and the condition is very rare in the pediatric age group. Although surgery is the mainstay of treatment, magnetic resonance imaging (MRI) can help in preoperative diagnosis, thus avoiding the high morbidity and mortality associated with the surgery. We hereby report a case of a 10-year-old female patient with isolated intramedullary cysticercosis, who responded dramatically to medical treatment. A 10-year-old female patient presented with gradual weakness in both lower limbs and numbness from lower thorax to foot for 3 months. There was also history of bowel and bladder incontinence. There was no history of fever, rash, or trauma. The child was conscious with preserved higher functions. Neurological examination revealed spastic paraplegia (motor power 3/5), brisk B/L deep tendon reflexes with extensor plantar and loss of sensations to pinprick bilaterally below T5 dermatomes. Peripheral blood count was normal. Mantoux test was negative and radiographs of the spine and chest revealed no abnormality. Contrast-enhanced MRI of the spine revealed an isolated, well-defined, intramedullary cystic lesion measuring 1.8 1.0 cm at the level of D2 vertebral body. On T1-weighted imaging, the lesion was hypointense with a central isointense mural nodule [[Figure 1]a]. The lesion was hyperintense on T2-weighted image with an isointense mural nodule [[Figure 1]b and c]. There was edema of the surrounding cord. Ring enhancement was seen on post-contrast T1-weighted image [[Figure 1]d]. Based on these findings, a diagnosis of cysticercus cyst was suggested. Screening of MRI brain was normal. CSF examination done revealed elevated protein and normal glucose levels with increased lymphocytes, and few eosinophils and positive enzyme-linked immunosorbent assay (ELISA) for anti-T. solium IgG immunoglobulin. Keeping the provisional diagnosis of cysticercosis in mind, empirical treatment with antihelminthic along with steroids was started. Marked clinical improvement was seen within a few days in the form of increase in limb power and return of tendon reflexes. Complete improvement was seen during the follow-up period of 3 months. Cysticercosis is endemic in most of the developing countries like Brazil, Mexico, Korea and South Asian countries. , Intramedullary cysticercosis is rare even in endemic areas, with an incidence reported between 0.7% and 5.85%. Four forms of spinal neurocysticercosis have been identified: vertebral, extradural, intradural extramedullary and intramedullary, the commonest being intradural extramedullary region. Intramedullary cysticercosis is rare. About half the reported cases have concomitant extra spinal involvement. Extramedullary form occurs due to CSF dissemination (ventriculo ependymal migration) of focus in brain, whereas intramedullary forms result due to hematogeneous spread of the parasitic larvae. Intramedullary cysticercosis is most common in the thoracic spine due to high vascularity of this spinal segment. For the same reason, brain cysticercosis is commoner than spinal one. Neurological manifestations can be produced by the parasite itself causing mechanical compression and obstruction, surrounding inflammation, cord edema and residual scarring, pachymeningitis or syrinx formation. MRI is the investigation of choice in the diagnosis of neurocysticercosis. Usual MR findings include a cystic lesion with signal intensity similar to CSF on T1-weighted and T2-weighted MRI. A mural nodule, which represents the scolex, appears isointense or hyperintense on T1-weighted MRI and reverse on T2-weighted MRI. Cyst wall shows variable post contrast, usually a ring like enhancement. These findings are typically seen in vesicular stage. In colloidal stage, the thickened capsule is hyperintense on T1 WI and hypointense on T2 WI. ,, The role of MRI in the diagnosis of neurocysticercosis is well documented. It helps not only in the diagnosis but also in the preoperative localization of the lesion and the extent of involvement. MRI findings in neurocysticercosis can be non-specific, especially when scolex is not seen and the differentials for an intramedullary cystic lesion include hydatid cyst, dermoid cyst, post-traumatic syrinx, metastases and granulomatous diseases. But the presence of scolex and history of origin from endemic area enables differentiation from other disease processes. Surgery can eliminate the compressive element, especially in patients presenting with acute onset of symptoms, and in cases wherein the diagnosis is doubtful, surgical excision should be done. However, operative mortality is reported to be 15% and the morbidity is reported to be 85%,  but excellent results can be obtained with microneurosurgery. Based on MRI findings, some authors now recommend the use of antihelminthic drugs along with steroids without resorting to surgery. Steroids reduce the perilesional inflammation and also increase the blood levels of albendazole. Corral et al. treated their patients with drug therapy for 75 days and found that intramedullary cysticercosis resolved completely in a patient who was on albendazole treatment for cerebral neurocysticercosis. Parmar et al. found that out of four patients in his series, two reported complete resolution of the cyst on MRI, and marked clinical improvement was seen in all the four patients. Ahmad et al. reported successful treatment of a case of intramedullary cysticercosis with a 2-week course of medical therapy. Duration of medical treatment is unclear. Ahmad et al. reported achievement of cure within 2 weeks; however, some authors suggest 4-8 weeks treatment. Our patient was treated with albendazole and steroids for 4 weeks and showed marked clinical improvement. Isolated cysticercosis of spine is difficult to suspect; however, correlation of clinical findings, history of endemic area origin and typical MRI findings can help in making the diagnosis, thus obviating the need for surgery which is associated with high morbidity and mortality. 1. Alsina GA, Johnson JP, McBride DQ, Rhoten PRL. Spinal neurocysticercosis. Neurosurg Focus 2002;12:1-7. 2. Sheehan JP, Sheehan J, Lopes MB, Jane JA Sr. Intramedullary spinal cysticercosis. Case report and review of the literature. Neurosurg Focus 2002;12:e10. 3. Ahmad FU, Sharma BS. Treatment of intramedullary spinal cysticercosis: Report of 2 cases and review of literature. Surg Neurol 2007;67:74-7. 4. Sharma BS, Banerjee AK, Kak VK. Intramedullary spinal cysticercosis. Case report and review of literature. Clin Neurol Neurosurg 1987;89:111-6. 5. Gaur V, Gupta RK, Dev R, Kathuria MK, Husain M. MR imaging of intramedullary spinal cysticercosis: A report of two cases. Clin Radiol 2000;55:311-4. 6. 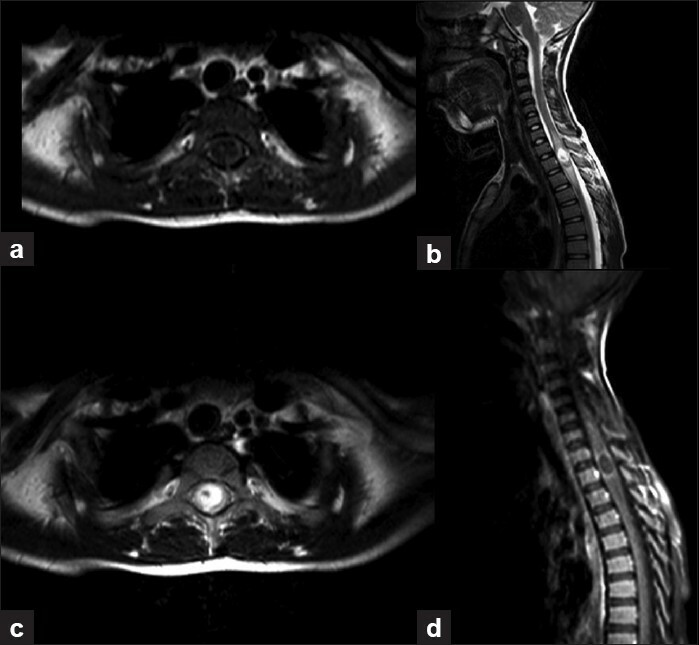 Ramos DM, Chin GS, Altman N, Duchowny M. Diagnosis of neurocysticercosis by MRI. Paediatr Infect Dis 1986;5:470-3. 7. Parmar H, Shah J, Patwardhan V, Patankar T, Patkar D, Muzumdar D, et al. MR imaging in intramedullary cysticercosis. Neuroradiology 2001;43:961-7. 8. Garg RK, Nag D. Intramedullary spinal cysticercosis: Response to albendazole: Case reports and review of literature. Spinal Cord 1998;36:67-70. 9. Holtzman RN, Hughes JE, Sachdev RK, Jarenwattananon A. An intramedullary cysticercosis. Surg Neurol 1986;26:187-91. 10. Corral I, Quereda C, Moreno A, Lopez-Velez R, Martinez-San-Millan J, Guerrero A, et al. Intramedullary cysticercosis cured with drug treatment. A case report. Spine (Phila Pa 1976) 1996;21:2284-7.